The topic of Korea's digital divide obviously attracts interest. It is the single most widely read post on this new blog. 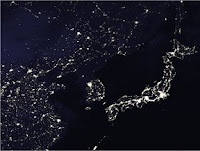 A bit of research on the web indicates that the existence of iconic satellite photographs of the Korean peninsula at night have contributed to the interest. These have indeed been widely circulated on the internet and have received some attention in the business and mainstream press. Former Secretary of Defense Donald Rumsfeld used such an image an October 11, 2006 news briefing following North Korea's nuclear test. The image used during his briefing shows not only the well-lit urban concentrations in South Korea, but also the bright lights of the squid-fishing boats off the east coast of the country. There are many versions of the satellite photos and some of the most interesting are those provided by Google Earth. For example, a researcher at the Georgia Institute of Technology has put together a world map of Earth Lights on Google Maps. You can also use an interesting overlay available within Google Earth to zoom in on the Korean peninsula at night. What all of these views have in common is that North Korea, with the exception of Pyongyang, is literally "in the dark." Not surprisingly, these images from space have come to symbolize the lack of modern communication networks in North Korea, compared with the south. 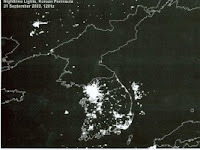 A view of the Korean peninsula representing the density of either fiber optic networks or mobile telecommunications networks would approximate what the satellites now capture at night.